With a pineapple tang and a creamy coconut finish, this Piña Colada mixer is undeniably delicious. Not only is this mixer great for Piña Coladas, it is also great for baking. 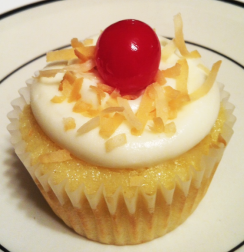 Check out our recipes for Pineapple Cupcakes and Coconut Cream Frosting. 2. Mix flour, baking powder, baking soda and salt in a medium bowl and set aside. 3. In a large bowl, medium speed beat the eggs and sugar until light & fluffy (about 2 minutes). 4. On low speed, mix in the oil, pineapple juice and vanilla until blended. 5. Add in the pineapple and sour cream, mix until fully incorporated. 6. Add the flour mixture and blend until just combined and smooth. 7. Fill cupcakes about 2/3 full. Bake 15-18 minutes (or 11-12 mini cupcakes). 1. Beat butter until smooth. Add cream cheese and blend until well combined, about 30 seconds. 2. Add vanilla, coconut and powdered sugar (1 cup at a time); blend on low speed until combined. 3. Slowly add the pineapple juice. 5. Pipe or spread onto cooled cupcakes.